ROMANCE! Andi read a romance novel! 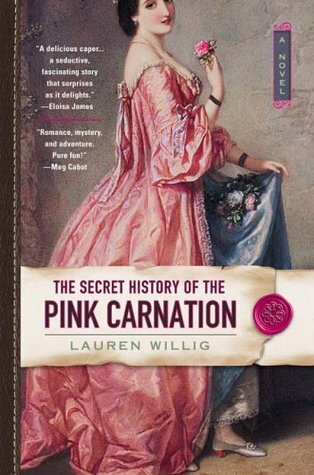 I picked up The Secret History of the Pink Carnation by Lauren Willig, the first in the lengthy Pink Carnation series, years and years and YEARS ago! I don't know if I really realized it was a full-on romance novel, or if I thought it was more tame-historical. I wasn't as...flexible...in my reading back then. Whatever the circumstances, I'm glad I added this one to my stacks because it was a fun one. And within that story is the story of Amy, a young girl who was born in France but was forced to relocate to English during turbulent political times. When she returns to France she's bound and determined to join the league of the Purple Gentian and do some spying of her own. First, she must contend with Sir Richard Selwick, a dashing, if annoying, gentleman who is, of course, more than he appears. So silly, so fun, so saucy. Most of the reviews I've read of this one cite it's far-fetchnedness and the light plot, but I really dug that. I liked the time shifts from Eloise's life to Amy's. I also really liked that the women in this book were daring and headstrong. I will definitely read more when I need a happy-making book with some historical flair. Link up your own #WeekofReviews posts down below! Yay! I love the Pink series and I just think Lauren Willig is a doll. The next book is my favorite so I hope you like it! I love how Eloise's story continues along with the Pink Carnation's. Oh good! I can't wait to try the second one. I do love Eloise's story, and I really thought it would just annoy me. Typically time shifts and dual narratives just put me in a bad mood, but this was really well done and I can see how it would add some continuity to the series. Good stuff! Exactly! Couldn't have said it better! Karen (Sassymonkey) loves this series and I keep meaning to read it and still haven't! I own the first book and everything. Must remedy that! Yes! She definitely gave me the push I needed to try this one out. So fun! This one doesn't sound like my cup of tea, but I do like mixing it up with something light and fun every once in a while! Me too! I've been craving light, fun things with more regularity lately. The state of the world is bringing me down. I couldn't remember what I thought of this book so I looked up my review. It's been close to 10 years since I read it! No wonder I forgot. Glad you enjoyed it! I had mixed feelings but actually said I wanted to read the second book, at the time. Never did. Ahhh, I'm notorious for that! lol I'm gonna look for the second one once I read my TBR down a bit further. Library probably has it, too. Can't wait! And the library only has books 8 and 10. UGH. I'm listening to a later book in this series on audio atm and I'm enjoying it too! Definitely leans toward the romance genre, which I wasn't expecting. Oooh, I bet these would be so great on audio. I'll have to see if Scribd has any of them. I read the first one, AGES ago, and I enjoyed the light comedy. Never did keep going though. Wheee! Definitely a light comedy. Of course my library only has books 8 and 10. I haven't picked up a romance novel in soooo long. This might have to be necessary very soon. I've mostly heard good things about this, but I haven't picked it up yet myself. It sounds like fun!